Cyril Jackson was born in Northwood, Staffordshire, the fourth son of the Revd Charles Bird Jackson and Mary Jackson (nee Compton). He attended boarding school in Lincolnshire and later at Newark. 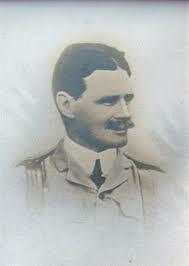 On 5 November 1888 he received a commission in the Border Regiment. He served in Malta with the 2nd Border Regiment in 1889 and from there proceeded to India in February 1890 on HMS Malabar and was stationed at Chakrata. However he was soon returned to England on sick leave after contracting fever. He went out to India again in March 1891. In 1892 he was attached to the 27th. Madras Native Infantry, Indian Army in Mahidpoor, Lucknow and transferred to the Indian Army in April 1893, being posted to the Bhopal Battalion, in Sahore, Bhopal. He married Beatrix Clara Grey at St Thomas’ Church, Calcutta on 9 March 1899. Jackson saw service in Afghanistan and Kashmir before being stationed in Allahabad for several years as Adjutant to the local levies. In 1914 was given the command of the 103 Maharattas Light Infantry and formed part of “D Force” in the Mesopotamian Campaign. He was killed by enemy action near Baghdad. According to report a shell landed on a tent during an orders meeting and killed several senior officers, although later research seems to indicate that he died under the Turkish machine guns.